Only the vivid imagination of James Rice could capture the arrival of Santa on Christmas Eve in such active detail. From the dancing mice who decorate the Christmas tree, to the bumbling reindeer landing on the family’s roof, his colorful illustrations warm the hearts of children and adults alike. 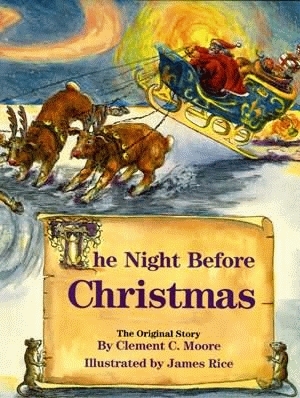 After writing and illustrating several parodies of Clement Moore’s classic Christmas tale, author/illustrator James Rice uses his unique style to illustrate the original version of St. Nick’s visit. What’s more, Rice’s talent for portraying emotions is particularly evidenced in The Night Before Christmas as Poppa reacts with surprise, Santa chuckles with glee, and Grandpa’s photo, hanging next to the Christmas tree, watches the whole nighttime adventure with a skeptical eye. James Rice (1934-2004), in his long, distinguished career as an author and illustrator, produced fifty-plus children’s books, among them an addition to The Night Before Christmas Series, Gullah Night Before Christmas. With more than a million and a half copies of his books in print, he ranks among the nation’s best-selling creators of children’s books. Mr. Rice died at his home in Hico, Texas in May 2004.